A new approach to paying for medical care that incentivizes quality and value. Other demonstrations initiated by Federal law. Some APMs will qualify as “Advanced APMs." Over time, additional types of Advanced APM options will become available. What is an Advanced APM? Advanced APMs largely involve accepting risk based on the quality and effectiveness of care provided, like in an accountable care organization (ACO). However, Medical Homes (initially as expanded under the CMS Innovation Center—currently there are none) can qualify as an APM without taking on financial risk. 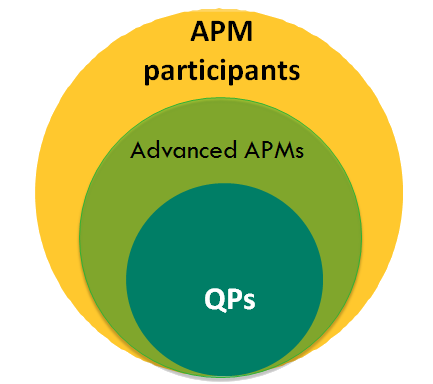 Over time, as CMS modifies and expands the criteria, more models will qualify as Advanced APMs. ACP is working to expand the options for advanced APMs, especially so that it will be easier for small practices to participate. What is the difference between an APM and an Advanced APM? They base payment on quality measures comparable to those in MIPS. They require the use of certified EHR technology. They either (1) bear more than nominal financial risk for monetary losses OR (2) are a Medical Home Model as expanded under the CMS Innovation Center authority. How do I know if my ACO or APM meets the criteria of an Advanced APM? What is a Qualifying Participant (QP)? A small group of clinicians who participate in Advanced APMs in 2018 will be Qualifying APM Participants (QPs) and will earn a 5% incentive payment in 2020. To be a QP in an Advanced APM, an Eligible Clinician must receive at least 25% of Medicare Part B payments or see at least 20% of Medicare patients through the Advanced APM. Some clinicians may be in an APM but not be a QP. These clinicians will be in a MIPS APM and receive preferred scoring. Learn more about MIPS APMs. How will physicians be evaluated under an APM? Physicians who participate in an APM that is not determined to be an Advanced APM will be participants in the MIPS program; however, they will receive favorable scoring under MIPS. Be paid according to the rules established as part of their APM (e.g., care coordination or infrastructure payments, shared savings, bundled payments, etc.). Not be subject to MIPS. Receive a 5% lump sum bonus payment on their fee-for-service reimbursements for years 2019-2024. Receive a higher fee schedule update for years 2026 and beyond (0.75%). Not all clinicians in an Advanced APM will qualify – they must have a certain number of patients or payments from the Advanced APM. The proposed thresholds are a calculated ratio and increase each year of the program. Head over to the CMS website to look up your QP status based on calculations from claims during the most recent snapshot period.